Not too long after my university years, I lived in France for awhile. While I loved my home in the Dijon region in central-eastern France, I always harbored a not-so-secret desire to head south to Provence to see the famous lavender. I never did make it but – lucky me – I moved to Japan not long after and Hokkaido has a similar summer landscape. From the end of June to the beginning of August, the center of Hokkaido is awash with carefully-cultivated color. Lavender has been grown in Japan for at least half a century. It was once sold exclusively for commercial use, but with the arrival of cheaper imported lavender in the 60s and 70s, the demand for homegrown lavender dropped significantly. Today, the fields remain but attract only tourists. Be warned, though – these are not fields of wild flowers that you stumble across haphazardly, as I expected. The lavender is confined to farms, with the two mentioned below being the highlights (in my opinion). 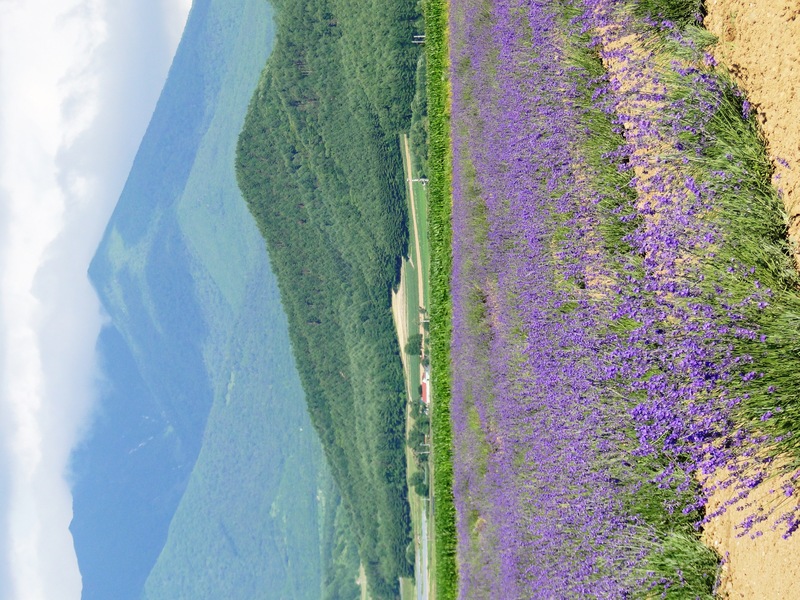 The main flower farms are centered around the towns of Biei and Furano. In Biei, head for Zerubu Hill. You’ll be treated to lavender but also to fields of sunflowers and patches of geraniums and marigolds. There is a large grassy hill, perfect for kids (and kids at heart) to roll down or run around. As the grounds here are quite extensive, there is the option to rent an ATV (I kid you not) to drive on a dirt track around the flower displays. Further south in Furano, the place to head is Farm Tomita. This is probably the best-known lavender farm in Hokkaido, dating back to 1903. The farm began to cultivate lavender in 1958 and is famous for their original lavender essential oil. But you can find almost anything in lavender hue or scent at the gift shop – the lavender ice cream is always a fun treat. The farm is divided into several different sections, but the lavender fields (some on the hillside and some on the plain) are the most popular. A few kilometers away, Farm Tomita East is less visited and offers open fields of lavender framed by the peaks of Daisetsuzan National Park. The lavender farms are surprisingly free to visit and there is ample parking on-site. In summer, there is a special stop on the local train at Farm Tomita in Furano. Thank you for your kind comments regarding my site! At the moment, things are a bit busy as I prepare to move in the next few weeks, but perhaps after we settle in to our new home, I’ll have time to check out your website in greater detail. In the meantime, best of luck! Thank you for your reply =) I hope to hear from you soon.